Gwen Pew takes a sneak peek at the first six stations to open as part of the brand new Downtown Line. Bugis Station. Image courtesy of Morven Koh. With a new exit pavillion built along Tan Quee Lan Road (Exit D), the Downtown Line platform is a bit of a trek from the original East West Line station under Bugis Junction mall. If you want to transfer between lines here, expect at least a five minute walk (even with travellators) along a newly-built underground link – though we like that the walkways have a glassy and futuristic look (featuring an art installation, ‘Ephemeral’ by Patrick Chia). Standing at 42m below ground level, Promenade takes over Bras Basah (35m) as the deepest station on the MRT line. The two new Downtown Line platforms are located beneath the existing Circle Line ones – there’s a very long escalator down to the concourse. The artwork on the walls of the new platforms, entitled ‘Earthcake’, is created by Ana Prvacki and inspired by kueh lapis as well as striations created by different types of rocks piled on top of each other. There are no new exits. The Downtown Line train track runs directly parallel to the Circle Line here, which means that the lines share the same platforms, making it one of the most convenient transfer points in the MRT system. 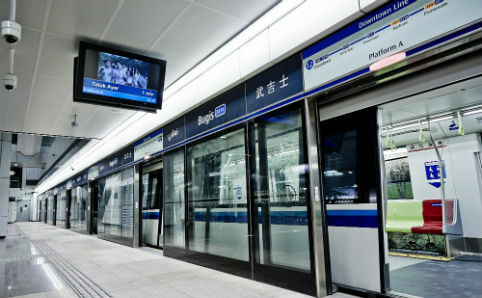 Located along the south end of Marina Bay, the namesake stop for this line is one of two new stations opened in phase 1. The platforms are both located on the basement level but are divided by a wall – decorated with an artwork called ‘Leaves’ by local ceramics artist Jason Lim – so you’ll have to go up and around to switch directions. Despite the stop’s compact size, there will be six different exits, with most of them connecting directly to Marina Bay Link Mall. Located under the junction of Cross Street and Telok Ayer Street, the station stands in between Chinatown and Raffles Place. The two platforms are located at the Basement 2 Level, albeit on different sides of the station (similar to the Downtown station), while the ticketing concourse is on the floor above and riders will have to take another escalator up to reach the ground level and exit through one of the three entrances. The Downtown Line platforms are located on a floor above the existing North East Line station, which means that switching between the two lines only requires a relatively short walk. Still, a new concourse area has been built – accessible through new Exits F and G (leading to Hong Lim Complex and Chinatown Point, respectively – both along Cross Street) – which features ‘Flying Colours’: vibrant, abstract sketches of laundry on invisible drying lines created by Cheo Chai-Hiang, one of the founders of local modern art.